Despite a dry summer, there are still flowers in Bishop’s Mills! Earlier this spring we hosted another successful fundraising music night at our beautiful Community Hall! A full house turned out to hear the sweet sounds of Kristine St. Pierre, Mally Krock and George Buys. Thanks to all who helped make the evening so awesome! In May we celebrated our 13th Annual Bishop's Mills Community Day, with visitors from near and far taking advantage of the delicious baked goods at the Women’s Institute Bake Sale and checking out the silent auction at the Community Hall. Others visited the UCW lunch counter and craft tables at the St. Andrew's Church Hall. This year is the 40th Anniversary of the Bishop’s Mills Community Association! To celebrate, we’re throwing the doors open and showcasing our community this Saturday, Sept. 24. Save the date! The United Pentecostal Church (the village's former one-room school house!) will be open. Summer has finally arrived in Bishop's Mills (Honest! There was still snow in some parts of the area til early May!). This spring saw lots of visitors to the Village. 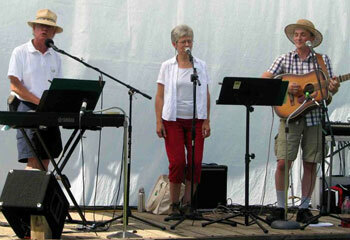 In March, we had a full house at the Community Hall for our annual Music Fundraiser. Stars of the show included George Buys from Kemptville, and local female a cappella group Bella Borealis. Over $600 was raised in support of the Hall. On Saturday, May 17, our Annual Bishop's Mills Community Day attracted many people to the the Village. The event was once again hosted by the Bishop's Mills Community Association, the Bishop's Mills Women's Institute, and the United Church Women. 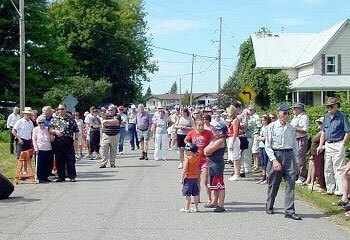 Garage sales were set up throughout the Village and area, the United Church Hall offered goodies and lunch for sale, and the Community Hall had a silent auction, bake sale and history displays set up. Of special interest this year was the old Post Office from the General Store. The Post Office fixture - which was set up in the Store from 1912 until it was taken out in 1970 - was kindly loaned to the Community by area resident (and former Storekeeper and Postmaster) Mildred Adams. Mildred herself spent a few hours in the Village that day, chatting with visitors about the old Post Office. See Photos page for a glimpse of these events. Join us for this year’s Winter Fun Day at the Park followed by a good old-fashion pot-luck supper at the Community Hall. Hopefully the ice will hold up till then so we can skate, play some broomball and enjoy some winter games for the young and young at heart. The rink events will start at 2:00 and supper between 5-6:00. Invite friends and relatives to make this a real Family Day. Please contact Linda at 258-2115 to discuss pot-luck requirements. 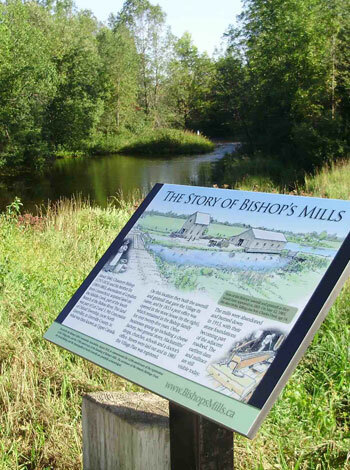 Last year, the North Grenville Heritage Advisory Committee worked with the Bishop’s Mills Community Association in designing a heritage plaque for the Bishop’s Mills Community Hall. The official unveiling of the plaque will take place at the Community Hall this Sunday, Feb. 16 at 4:30 pm (between the Winter Fun Day activities at the Park and the pot-luck supper at the Hall). Several dignitaries have been invited for the event. We hope that some of them will stay and join us for the pot-luck supper. Mark your calendar for the annual Bishop's Mills fund-raising concert on Saturday, March 29 at 7:30 pm at the Bishop's Mills Community Hall. This year’s concert will offer a unique blend of music by some exceptionally talented musicians including George Buys, Bella Borealis, Tom Graham and Jeanne Lambert! Then enjoy some the best homemade refreshments following the concert! Tickets are $12 each and are available from Catherine Johnson at 613-866-1961. Bring along your friends for a great evening of entertainment! All proceeds go toward the maintenance of the Community Hall. Tickets are limited so get yours quickly!